The Gordie Howe International Bridge, a bi-national border infrastructure project, will be one of the longest bridges in North America. The new bridge will connect Canada with the U.S., ensuring the effective flow of commerce between the two countries. Early works activities will prepare the Canadian Port of Entry (POE) for the new bridge. This includes the construction of a new, four-kilometer, two-lane perimeter access road. The new road will surround the Canadian POE and provide employees and customers with access to local businesses, and provide access for emergency services such as fire and police. Before the perimeter access road could be built, a stormwater management system designed to collect rain runoff from the road needed to be installed. The PAR stormwater management system includes a Vortechs hydrodynamic separator from Contech. Vortechs combines swirl concentration and flow controls into a shallow treatment unit that traps and retains trash, debris, sediment, and hydrocarbons from stormwater runoff. 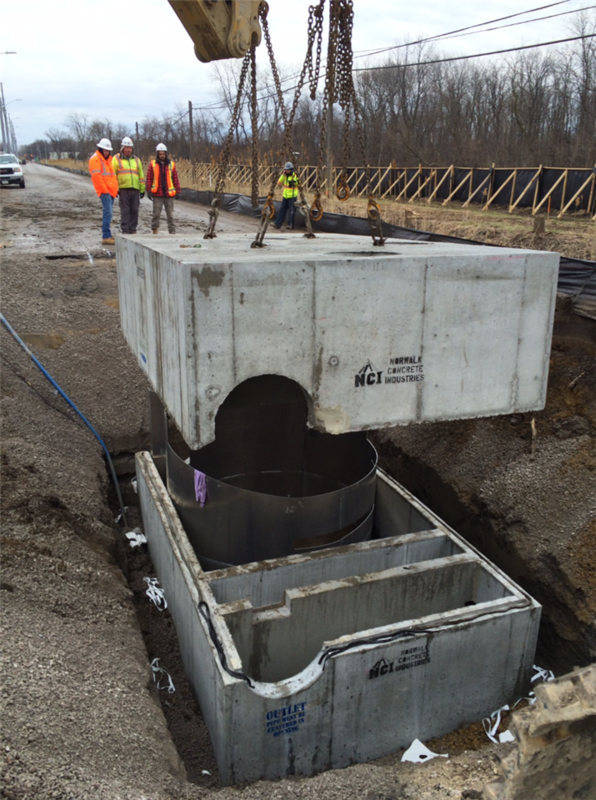 The Vortechs was chosen for this application because it can handle flows from a 100-year storm as well as act as an oil/grit separator for the access road, treating the water before it is eventually discharged into the Detroit River. Contech had to provide a design that would not only be able to capture the oil and grit from the runoff, but also be able to handle the potential for higher flows, all while being cost effective. Contech provided design calculations and installation estimates to help the engineers better analyze the benefits of the Vortechs unit. Because of the use of only one unit, installation was quick and easy.The crew was able to lower the precast vault into place, install the internals, install the top slab, and make the connections to the inlet and outlet pipes in just a few hours.